Our Middle Pickup Switch M1 is a "customer installed" product. Although it can be used to control any single-coil pickup, it is typically used with our HSH Stratocaster upgrade product; as well as our T4-Switch product that will be used to control a middle single-coil pickup. The M1-Switch gives you control over the single-coil pickup by turning it Off or On (either in normal phase or reverse phase). It can be used with our T4-Switch or T4Plus-Switch on your instrument with HSH pickup configuration (your instrument must have two 4-wire humbucker pickups) to give you more pickup tones. Combining our Middle Pickup Switch M1, our T4-Switch or T4Plus-Switch and the below Volume-Tone control type on your instrument with HSH pickup configuration, you can get more pickup tones. Used with VT-2 Volume-Tone control (ID: 152) to get 212 pickup tones. Used with VT-3 Volume-Tone control (ID: 153) to get 272 pickup tones. Used with VT-4 Volume-Tone control (ID: 154) to get 276 pickup tones. 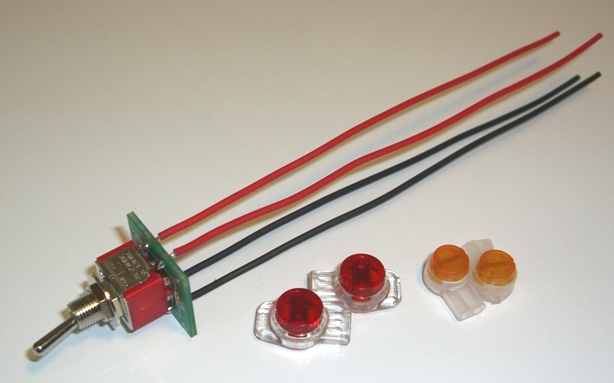 One M1 Middle Pickup Switch wired and tested with tagged wires, includes the following items. Note: Installing this product at the location you desire may require body wood removal.